The Blue Hibou Plume Carrier is composed of shoulder buckles and waistband with the option of a Single Adjust Buckle, Dual Adjust Buckle or a Ring Waist. The mesh is similar to the kind of fabric you’ll find on the breathable areas of athletic shoes, ball caps and other sports apparel. A wide variety of colours of mesh are available to coordinate with the colours of your wrap. The Blue Hibou Plume Carrier mesh panel that spans your baby’s back and bum area. The soft mesh allows for air flow through the fabric to keep your baby cooler in warmer climates. The mesh panel is uniquely designed to create a seat for your baby without the use of seat darts, creating the same comfortable experience that Blue Hibou carriers are known for. Blue Hibou Leg-Out Padding is second to none. Not only is it cushy foam, but its wrapped in blankety soft cotton to maintain its shape. The Blue Hibou shoulder straps are curved and generously padded with high density foam to provide long lasting cush. Ladder locks on the bottom of the straps provide easy adjustment on the fly. The top of the shoulders have Perfect Fit Adjusters (PFAs) so the caregiver can fine tune the strap length to their needs. And the icing on the cake is the easy adjust chest clip that slides along a webbing track, just another of the many features that make Blue Hibou Carriers adjustable for most body types. Completely unique to Blue Hibou Carriers! A truly Hybrid option, not as floppy a traditional floppy SSC waistband, but more flexible than firm closed cell foam waistbands. The Hybrid is built on alternating layers of canvas and cotton padding, formed into a 100% cotton pad that is inserted into the waistband itself. All the layers are completely top-stitched and quilted together, so there are no sliding layers and no bunching of padding. It is flexible enough to conform to your body right away, and with more use, becomes more and more form fitting to your waist, making it easier to get a tight fit. The natural cotton makes it far more breathable than foam padding. The Hybrid is the ideal waistband for 'wrappers', it gives a flexible, less structured feel to your SSC experience, allowing you to enjoy the soft feel of your wrap without feeling the stiffness of a closed cell foam waistband. Developed by popular request of some die-hard Blue Hibou Carrier fans! (I listen to your requests!) The 'Fusion' is a combination of a 'Structured' and 'Lightly Padded' waistband: the center portion under the baby's bum is approximately 11" to 13" (depending on the size of the panel) of Stiff closed-cell foam padding. 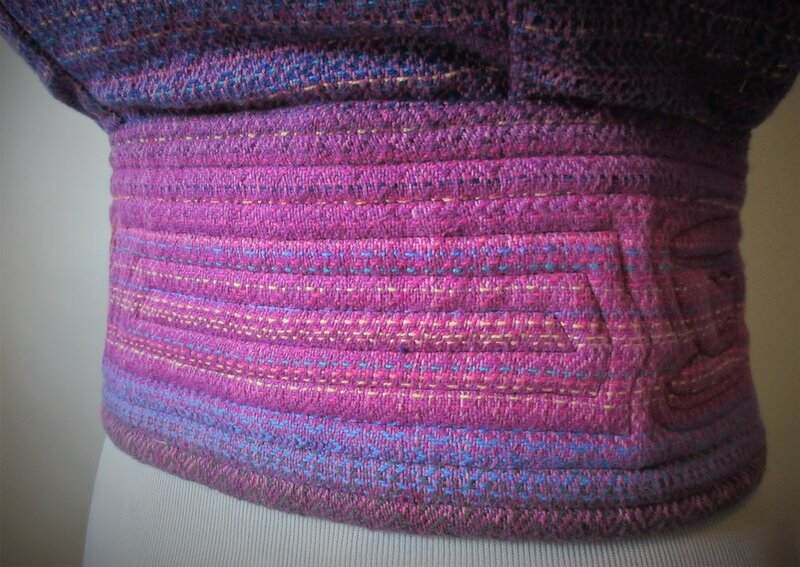 Then the sides of the waistband are lightly padded and quilted. Anyone who has used a closed cell foam waistband knows they can be quite unforgiving at times. If you've experienced the waistband of your pants being 'pushed' down by the waistband of your carrier, you know exactly what I mean! This waistband makes it easier to get a tighter fit, thus preventing this from happening. Your baby's bum will inevitably sit deeper into the seat of the panel. The standard option for Blue Hibou buckle carriers, the Dual Adjust allows for the buckle to be positioned anywhere along the webbing. Both ends have elastic loops to take up any additional webbing, keeping a tidy appearance. Using the same RockLok Buckle, this Single Adjust is anchored to the waistband on one end and adjustable via a long strap of webbing. A generously padded flap positioned under the buckle itself prevents it from digging into skin or hip bones! In other areas of the babywearing world, this type of carrier style is also known as the 'reverse half buckle, ring waist' or abbreviated as RHB-RW. What sets Blue Hibou apart from other styles is the method Jo has designed for the attachment of the rings to the waistband, combined with the styles of waistband padding available.